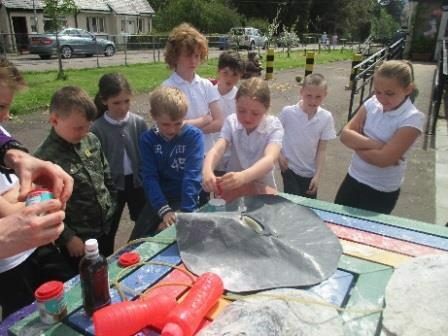 Lochgoilhead Primary welcomes a visiting Volcanologist! The children at Lochgoilhead Primary School were very lucky to be able welcome a visiting volcanologist to the school last week. Steve Wright shared with us his knowledge, passion and incredible first-hand experiences he has gained from visiting active volcanoes around the world. Volcanic rock and samples of meteorites were passed around as Steve answered excellent questions from the children. 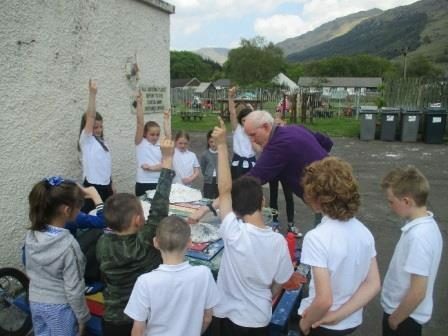 The children went also outside to take part in fun experiments to show how volcanoes erupt – they were told to stand right back otherwise they would have been covered in very colourful ‘lava’. Steve told the children that an erupting volcano sounds a bit like snap, crackle and pop so next time we are eating Rice Krispies we will be reminded of volcanoes. Another very interesting fact was that there is something in the classroom that we use daily that comes from a volcano… Graphite in our pencils – a very important tool in our school!